Top/Shirt : Gold Katan silk shirt is aqua and goldenrod heavy embellishments all over. The shirt is to have unique decorations with ribbon flowers. Scoop neck. Piping edges. Fully lined. 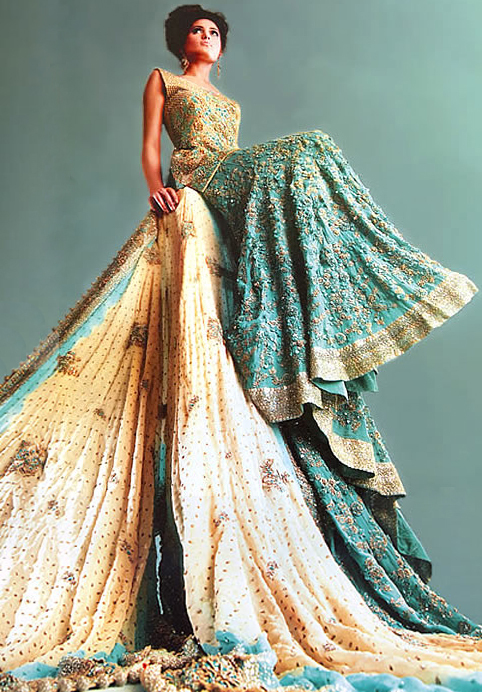 Bottom/Lehenga : Aqua crepe silk flared lehenga having heavy floral embellishments all over.The dress has medium/chapel train. Hemline has been fully decorated throughout. Fully lined. Hidden zipper at side. Dupatta / Veil : Gold crinkle chiffon dupatta having aqua dip dye effect on border. Small and medium sized ornamental motifs all together with heavy sequins spread. Dual heavily decorated border. Beaded lamp tassels on the edges. Complete with liner. Embellishment work includes sequins, beads, Swarovski crystals, kora, Dabka, beaded onion, beads, cut glass and diamonds. 100% handmade embellishments. 100% pure imported fabric. An amazing bridal gown. We are grateful for this wonderful dress which we'v received today.You have earned our business and made a very happy customer. Click the button below to add the BW8506 Gold & Seagreen Lehenga to your wish list.